The RECURA Kliniken group will introduce as a next milestone the mobile and digital health engagement solution developed by dacadoo as an integral part of their existing corporate health management offering. 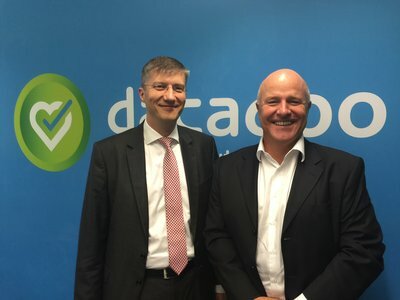 The RECURA Kliniken group and dacadoo ag sign a strategic cooperation in the field of digital corporate health management for all member institutions of RECURA Kliniken in Germany. The RECURA Kliniken group will introduce as a next milestone the mobile and digital health engagement solution developed by dacadoo as an integral part of their existing corporate health management offering. dacadoo can be used as digital health and lifestyle navigation system for the employees. With dacadoo you can track, analyze and improve in an easy and fun way your health and your well-being. In cooperation with dacadoo, employees will get support in their fitness activities, no matter if they are running, horseback riding, playing golf, kayaking, mountain biking, gardening, walking, swimming, playing soccer, meditating, playing squash or volleyball, climbing, inline skating, dancing, doing yoga or doing any other fitness activity. "dacadoo is comparable to a journal of your own activities and health behavior. It tracks all your daily physical activities, shows you your performances, achievements and progress. In parallel you get hints for your health and nutrition. You can also connect with friends and colleagues via dacadoo and share your activities with them or, once in a while, invite them to small challenges. I am very excited about this collaboration with dacadoo." states Dr. Matthias-Hagen Lakotta, Director of Medicine, Strategy and Subsidiaries of RECURA Kliniken group. Peter Ohnemus, president and CEO of dacadoo adds: “Digital corporate health is still at its early stage in Germany and therefore we are very proud to sign this strategic cooperation with RECURA Kliniken group”. In order to properly motivate the employees, fitness activity challenges will be organized regularly within RECURA Kliniken via dacadoo. Moreover, in the near future the current corporate health offering will be expanded for the group. The RECURA Kliniken Group is a privately held company committed to the patients’ well-being operating in Berlin-Brandenburg and central Germany. Our patients bring us their trust, which we honor with highest quality treatments, care and research. Likewise, we promote the well-being of our employees, who contribute to the company with their full commitment, knowledge and skills. RECURA Kliniken faces different challenges in the medical field. We provide excellence at every level with experienced staff and the latest technologies. At the same time, we aim for closeness and care for our patients and their relatives to a large extent. The RECURA Kliniken group is a stable and sustainable family business. Our focus is the well-being of our patients and staff, not the profit maximization of shareholders. We are partners of every region we operate in and cultivate contacts with citizens, local communities, doctors and other medical institutions. With secure jobs, training and career opportunities as well as active participation in public life, we want to contribute to the community. The dacadoo mobile health engagement solution enables individuals to track, manage and benchmark their health and wellbeing in an easy and fun way on their smartphones. dacadoo calculates a personal Health Score, a scientifically calculated number from 1 (low) to 1,000 (high). The Health Score works as an indicator and moves up or down in real-time, depending on how body values, emotional well-being and activities (exercise, nutrition, stress and sleep) change. To help individuals remain engaged, motivation techniques from behavioral science and online games, collaborative features from social networks, and personalized feedback are applied. The award-winning company is working with strategic partners from the various key industry segments to bring this solution to the global mobile health market. dacadoo has its headquarters in Zurich, Switzerland and an affiliate in Palo Alto, USA.